Recently, I went to Komé, one of my favorite sushi restaurants in the Bethlehem area. Even though I commend them on their sushi, they are more than just a sushi restaurant. All of their other food is great – I’ve had some great salads by them, and they’re duck is also phenomenal. Last time I went there, I decided to order a roll of sushi and something else. I wasn’t quite hungry enough for two rolls, but I wanted more than one. 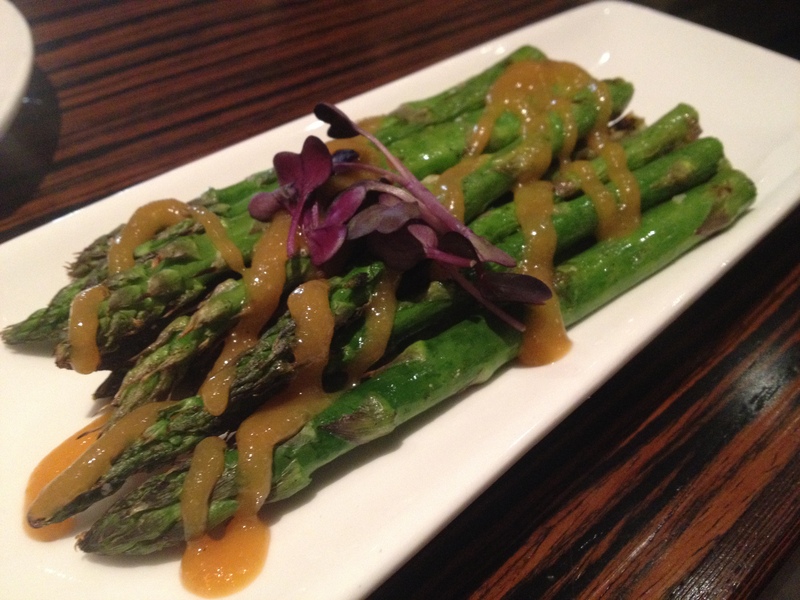 Instead of getting miso soup, I decided to try something new and order grilled asparagus with mustard-miso vinaigrette. I was a bit hesitant to order this at first because I’m not a big fan of mustard, and I’m normally sensitive to the taste of it. I ended up really enjoying it though, and I would order it again. There was a slight mustard taste to the vinaigrette, but it wasn’t overpowering. The miso in it added a nice Asian flavor to it, which helped to mask the mustard. The asparagus was cooked well, but I really enjoyed the vinaigrette on it because it was a nice way to spice up a simple vegetable side dish. For my main meal, I ordered the passion lobster roll, which is a specialty roll. It consisted of steamed lobster, avocado, cucumber, smoked salmon on top, mango salsa, and mint aioli. I normally get the same roll every time I go there, but I always forget the name of it so I typically guess. This time I guessed wrong, and ended up getting a different roll from my usual. I was slightly disappointed that it wasn’t my usual roll because it’s fantastic – ergo why it’s my usual. This roll was still great though, and I can’t complain because I didn’t end up with a bad meal. The mango salsa added a nice fruity flavor to it, which complimented the avocado while playing against the mint aioli well. I kept dipping my sushi around in the salsa because it was so yummy and added some nice flavor to it. The roll wasn’t warm, which I think it my biggest complaint about it because I prefer warm sushi. Overall, it was delicious. I was upset it wasn’t the roll I was hoping for, but it still tasted yummy so I can’t complain. Besides the food, the decor and atmosphere are my favorite thing about Komé. It has a simple, modern, and elegant feel to it. The colors are warm yet not too dark, and the setting is intimate. It is pricey – I don’t go there often unless I’m with family or if my friends and I are treating ourselves to a nice meal – but it is worth it when you’re looking for a great meal. I took my mom there one time and we ordered the Japanese oysters, which are flown in from Japan. We had them in May, and she still talks about how great they were to this day. The service is also very good. The waiters and waitresses are all trained very well and know what they’re doing. I think Komé is one of the better Japanese restaurants to go to in the area.